Avulsion is one of the most complicated types of trauma to the teeth, frequently seen in children aged 7–9 years, where a total displacement of the tooth from its socket occurs. It represents 0.5%–3% of the traumatic injuries to the permanent dentition. Avulsion causes the severing of the periodontal ligament (PDL) and disruption of the vascular-nerve bundle, with a consequent loss of blood supply to the tooth, which can lead to pulp necrosis. According to the guidelines recommended by the International Association of Dental Traumatology (IADT), replantation is, in most situations, the treatment of choice for avulsed teeth but cannot always be carried out immediately. Appropriate emergency management and treatment plan are important for good prognosis. At the time and site of an accident which leads to an avulsion injury, the immediate replantation of the avulsed tooth may not be feasible, owing to the various associated factors such as the person's conscious state, lack of first aid knowledge, informed consent issues, and lack of confidence in strangers gathered at the scene of accident. Dental practitioners also encounter problems relative to the management of the avulsion as it involves consideration a lot of associated factors, such as the place where the trauma took place, whether the child was immediately attended to, the extraoral dry time, the stage of root development of the avulsed tooth, storage medium used, any associated trauma to surrounding soft tissues, and health status of the child. In this difficult situation, wherein the individual may have suffered multiple injuries other than avulsion, the factors such as type and intensity of injury, stage of root development, and contamination are not in control of any individual. However, the factors such as extraoral dry time and the type of storage media are invariably, in the control of individuals present at the accident site, and play a decisive role in the successful treatment of the avulsed tooth by a clinician. Replantation may successfully save the tooth, but it is important to realize that some of the replanted teeth have lower chances of long-term survival and may even be lost or extracted at a later stage. Prognosis of replanted teeth depends on (i) the amount of physical damage to the root surface (cementum and PDL cells), (ii) the extraoral (dry) time,,, (iii) the type of storage medium,,, and (iv) the amount of root development of the avulsed tooth. Choice of treatment is related to the maturity of the root (open or closed apex) and the condition of the PDL cells. An immature (i.e., open apex) tooth has the potential to establish revascularization when there is a minimum of a 1.0 mm apical opening, thereby pointing at a possible favorable outcome. The periodontal reactions to replantation, as we know, occurs in four different manners, namely, healing with normal PDL, healing with surface resorption, healing with replacement resorption (ankylosis), and healing with inflammatory resorption (infection), of which the former two are the favorable outcomes of the replantation procedure. The storage medium and the extraoral dry time are extremely critical for survival of the PDL cells. After a dry time of 60 min or more, all PDL cells are nonviable. In permanent avulsed teeth, this increases the risk for pulp necrosis, root resorption, and ankylosis. For this reason, it is important to assess from the patient's history – the dry time of the tooth, before it was replanted or placed in a storage medium. Although plenty of research has been done on replantation of avulsed permanent incisors, not many articles are available to help us determine the prognosis of the replanted avulsed teeth to provide evidence in deciding on an ideal treatment protocol which can lead to good prognosis. Furthermore, the retrospective studies in the literature fail to provide any standardization regarding the treatment protocol and outcome. Hence, a systematic review comprising multiple case reports can be considered as helpful evidence for deciding the chairside treatment protocol and outcome in both emergency and delayed cases. The present systematic review aims to determine the prognosis of replanted avulsed mature and immature permanent incisors having an extraoral dry time of >60 min. Hand searches were undertaken to find additional relevant published material that might have been missed in electronic searches. The articles published from January 1, 2000, to September 30, 2017, were included in the study. In the first step of the screening process, titles and abstracts were used to identify full articles concerning the prognosis of avulsed mature and immature permanent teeth in pediatric population. In the second step of the screening process, the duplicates from the respective searches were removed and one single article was selected. In the third step, these articles were subjected to the inclusion and exclusion criteria of the review. Studies reporting follow-up 24 months or more. Studies reporting replantation of avulsed permanent teeth. All the studies identified by applying the inclusion and exclusion criteria underwent assessment for data extraction by a single reviewer. The data were extracted using specifically designed data extraction forms. For each included study, the qualitative and quantitative information was extracted, including year of publication, experimental and control treatments, numbers and age of patients, treatment and follow-up durations, author's conclusions, and all the information needed for methodological quality evaluation. S – Study design: Case report and case series. The data search was carried out by initially identifying 1485 articles from electronic database based on the title relevant to the systematic review. Majority of the articles were retrieved from the PubMed database. After removal of 30 duplicates, 1326 articles remained which were screened through abstracts. Of these, 129 full-text articles were analyzed for eligibility, of which 11 were selected for qualitative synthesis of the systematic review. This comprised 8.53% of the total articles obtained pertaining to the data search (11 out of 129). The selected articles in the systematic review are included in [Table 1] followed by the articles excluded enlisted in [Table 2]. Selection of studies was done initially by reading the title and abstract of the articles obtained from each database. Only those articles that were relevant to the review were collected and put for further evaluation. Articles reporting information based on dental trauma other than avulsion, avulsion and replantation for primary teeth, and animal studies were excluded. Case reports, case series, and longitudinal studies fulfilling the inclusion criteria were assessed further for the review. Full-text articles of the selected abstracts were then evaluated independently. The selection process involved two independent investigators, and a consensus decision was made with a third evaluator to shortlist the articles that met all the inclusion criteria for the systematic review. Reference lists of the selected articles were also searched for additional data that may have been missed. There were no restrictions placed on the maximum follow-up period or sample size for the studies selected. The study selection was done using the PRISMA 2009 guidelines as mentioned in [Table 3]. The data were collected and analyzed from each article on discussion by the same investigators who selected them, and a standard pilot data extraction sheet was prepared in consultation with the evaluator as an expert. The searches identified 1485 studies. After removal of duplicates and screening the abstracts, 129 full-text articles were selected. Of these 129 articles, only 11 articles fulfilled the inclusion criteria. A summary of all the included trials is shown in [Table 4]. 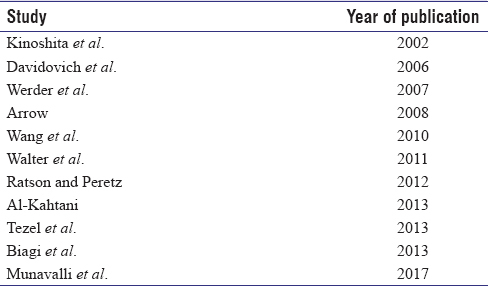 In spite of many studies investigating the prognosis of replanted avulsed permanent incisors, only 11 studies were considered appropriate for inclusion in this systematic review. It was possible to formulate a quantitative conclusion because only the case reports following IADT guidelines were included for assessment. The advantage of assessing only case reports was that they could provide evidence for deciding the chairside treatment protocol and outcome in both emergency and delayed cases. The disadvantage with the assessment of retrospective studies was that they fail to provide any standardization regarding the treatment protocol and outcome. There are different criteria to evaluate the prognosis of replanted avulsed permanent teeth. These include the amount of physical damage to the root surface (cementum and PDL cells) the extra oral dry time, type of storage medium and the amount of root development of the avulsed tooth. A variety of other factors such as age of the individual, type of splinting, mastication, treatment of the socket, endodontic treatment, antibiotics and time of replantation, macroscopic contamination, storage media, and storage period can also influence the clinical success of replantation. The most important is survival followed by healing of the PDL cells. The long-term retention of replanted avulsed permanent incisors is directly affected by the health of the PDL cells. There are reports of replanted teeth remaining in function for over 30 years. On an average, they are functional at least for 5 years, and most are ultimately lost because of progressive root resorption or other associated problems such as ankylosis. The replanted teeth were followed for different evaluation periods up to 10 years in our systematic review, the mean radiographic examination being 2–5 years. The periodontal reactions to replantation, as we know, occur in four different manners, namely, healing with normal PDL, healing with surface resorption, healing with replacement resorption (ankylosis), and healing with inflammatory resorption (infection), of which the former two are the favorable outcomes of the replantation procedure. Andreasen et al. studied PDL healing following replanted permanent incisors and concluded that the most significant factors in PDL healing were stage of root development, length of extra-alveolar dry storage, immediate replantation, and length of wet storage, and they have recommended immediate replantation wherever possible. Thus, we can state that the prognosis of an avulsed tooth is proportional to its extraoral time, which is a direct correlation of the status of the PDL cells. If immediate replantation in cases of a severely injured or conscious patient is not possible or in cases where the tooth is severely contaminated, vitality of PDL cells on the root surface must be maintained for a period by storing the tooth properly during the extra-alveolar time. Experimental studies have shown that storing the tooth in milk, saliva, Hank's balanced salt solution (HBSS), and coconut water,,,, or wrapping the tooth in plastic foil, prevents the PDL cells from injury and prevents later root resorption. The choice of treatment is related to the maturity of the root (open or closed apex) and the condition of the PDL cells. An immature (i.e., open apex) tooth has the potential to establish revascularization when there is a minimum of a 1.0-mm apical opening, thereby pointing at a possible favorable outcome after replantation. Cvek et al. have reported a higher revascularization rate after soaking the tooth in doxycycline. The topical application of doxycycline was found to decrease the frequency of microorganisms in the pulpal lumen, thereby decreasing the frequencies of ankylosis and inflammatory root resorption and resulting in a favorable prognosis post replantation. The mature teeth in children and adolescents exhibit more extensive inflammatory root resorption after replantation compared to adults. The mentioned increase in resorption rate is related to the bone remodeling which is more extensive in children during the growing period. The root resorption and ankylosis may give rise to infra-occlusion during the growing process. Arrow has described the formation of calcific material within pulp space of a replanted avulsed immature tooth along with normal PDL with an extraoral dry time of 5–10 min after a 2-year follow-up. The robustness of Hertwig's epithelial root sheath to withstand trauma and retain its ability to function appears to be a major factor responsible for this. It is possible that pulp remnants were left in the socket and along with the remaining Hertwig's root sheath continued to function to mineralize both the dentine and cementum, contributing to the favorable prognosis. This case reported the initiation of calcification as early as 11 weeks after trauma. The reparative powers of periapical tissues have been reported in a number of articles describing the replantation of avulsed tooth with an immature apex. In the report by Greer et al., it was reported that there were pulp remnants in the tooth socket and the root that developed was similar to the contralateral incisor with calcified dentine and cementum. In this case report, the tooth socket was not observed after the avulsion, but it is possible that pulp remnants were left in the socket and along with the remaining Hertwig's root sheath continued to function to mineralize both the dentine and cementum. In one case of a luxated tooth without any active intervention as reported by Welbury and Walton, there was an apparent development of a root apex totally separate from the body of the tooth. In this study, the child was seen again 7 years after trauma and the radiograph showed arrested root development and an opaque mass apical to the tooth. The tooth and the opaque mass were extracted because of associated pathological changes. When the opaque mass was examined microscopically, it showed similar structure to that of a root apex. This case yet again highlights the capacity of the immature tooth structures to withstand considerable trauma and apparently retain their functionality. Kondo et al. have also described favorable prognosis after replanting a tooth with open apex within 10 min of avulsion. The tooth was subjected to endodontic therapy and showed apical barrier formation radiographically with normal color, response to palpation, and percussion. This favorable prognosis could yet again be contributed to vitality of PDL cells as a result of shorter extraoral dry time and implementation of endodontic therapy 3 weeks after trauma which aided in limiting the initiation inflammatory resorptive process. The risk of infection-related root resorption should be weighed up against the chances of revascularization in teeth with open apices. Such resorption is very rapid in teeth of children. If revascularization does not occur, root canal treatment may be recommended. Favorable healing of an immediately replanted tooth with mature apex was reported by Tezel et al. and Munavalli et al. The teeth showed functional stability, normal vitality, and radiographic findings. Another study by Walter et al. reported arrested resorptive process and a favorable prognosis at 3-year follow-up after endodontic therapy in replanted avulsed teeth having an extraoral dry time of 6 min. A slowly progressing replacement resorption occurred on the two central incisors, 11 and 21. Tooth 12 showed periodontal healing to a large extent. The three avulsed teeth were treated according to the same protocol; however, the differences in healing may be because of a different degree of PDL damage (Andreasen and Kristerson, 1981) or the biological variances, such as size of the root surface of the tooth types involved (Otis et al., 2004). The arrested resorptive process could have been seen as a result of the short extraoral dry time, use of a storage medium such as saline followed by administration of tetratcycline which induces antiresorptive and antibacterial effect, and last but not the least endodontic therapy. On the other hand, Davidovich et al. reported replantation of nonerupted tooth with open apex having an extraoral dry time of 10 min. After 2 years, the tooth showed favorable prognosis as the root was found to be fully developed associated with advanced obliteration in pulp space with normal PDL. Bone-like structure filling the entire pulp space was reported by Ratson and Peretz in a replanted avulsed immature tooth with an extraoral dry time of 30–60 min. According to the statement of Huang et al., even if infection is present in the canal cavity and reaches the periradicular tissues, stem cells from the apical papilla may survive and contribute to tissue regeneration. Therefore, appropriate management of an infected canal may provide a favorable environment for tissue regeneration. The report by Wang et al. describes the continued root formation followed by the formation of a hard-tissue barrier at the end of 1 year following replantation and conventional root canal therapy of a traumatically avulsed open-apex tooth with suppurative apical periodontitis, thus validating the statement of Huang et al. Some possible mechanisms may explain this phenomenon. First, it is possible that Hertwig's sheath survived and retaining its ability to continue its role of root organization when the inflammatory process was eliminated. Second, the mesenchymal stem cells may reside in the apical papilla of permanent immature teeth. These stem cells appear to be the source of odontoblasts and can develop root dentin. The cases reported by Chueh et al., Ding et al., Thibodeau et al., and Iwaya et al. have also shown regeneration of an open apex in teeth with pulpal necrosis and infection. Biagi et al. reported an unfavorable outcome of replacement resorption after a 2-year follow-up in a tooth with an extraoral dry time of 15 min followed by its placement for next 60 min in milk. In this clinical case, the development of the root was already complete, so the revascularization potential of the pulp was extremely limited. Hence, in this case, the replacement root resorption may have been caused by inadequate tooth storage: The tooth must not have been kept in milk immediately; however, only after a period in dry storage, the prognosis would probably be the same of any other dried and replanted tooth as dead cells cannot be revitalized by milk. Contrary to this, Al-Kahtani reported arrested external root resorption after a 2-year follow-up in tooth with no extraoral dry time but placed in milk for 45 min. This favorable prognosis would have been as a result of the ability of milk to maintain the viability of PDL cells. The recent studies performed by Souza et al. and Moreira-Neto et al. have stated that milk has a better capacity to maintain PDL cell viability as compared to coconut water of which the latter study showed an 80% viable PDL cells after 4 h storage in milk. A study by Werder et al. concluded that favorable periodontal healing was observed in teeth which had an extraoral dry time of <15 min. External root resorption was the most frequent complication of teeth having extraoral dry time of 15–60 min. Replacement resorption was seen in teeth which had an extraoral dry time >60 min. In a study by Kinoshita et al., four out of five teeth replanted within 30 min exhibited some degree of root resorption and thereby showing fair prognosis. One tooth showed unfavorable prognosis due to extensive inflammatory resorption. Thus, yet again, the study stresses on the importance of a minimum extraoral dry time for better prognosis. The PDL cells of the teeth which were stored in the storage medium were in compromised state due to the extraoral dry time of 30 min or more. However, the wet storage helped in maintaining the viability, thereby decreasing the amount of resorption that could have otherwise been possibly seen. The tooth which showed extensive inflammatory resorption had extraoral dry time of >1 h and the PDL cells were completely nonviable. No wet storage could bring back the viability of these cells owing to which the unfavorable outcome was observed. Based on the moderate level of evidence available to assess the prognosis of replanted avulsed permanent incisors by clinical and radiographic evaluation, it is fair to conclude that the prognosis of the replanted teeth was the best when the extraoral dry time was <15 min due to viability of the PDL cells. Teeth which were stored in osmolality-balanced media such as HBSS, saline, and milk showed better prognosis as they helped to maintain the viability of the of the compromised PDL cells. Furthermore, the replanted teeth with immature root development showed continued root development with normal PDL membrane or complete pulpal space obliteration indicative of a better prognosis over the replanted mature teeth which more often showed resorptive changes postoperatively. Complete matching of the samples would not have been possible at the start of the included studies due to different clinical scenarios of children reporting with avulsed permanent incisors and patient response toward the treatment. Short periods of evaluation and follow-up should not be indicated to assess the prognosis of replanted teeth, and hence, studies having a follow-up period <24 months were excluded. As the clinical scenarios are different for every case of avulsion, it is not possible to follow a particular treatment protocol that can help in determining the outcome of the replanted tooth. The prognosis of the replanted teeth also depends upon factors such as the extraoral dry time, storage medium used, and stage of root development. These factors cannot be standardized, can be subjective, and not under the clinician's control. 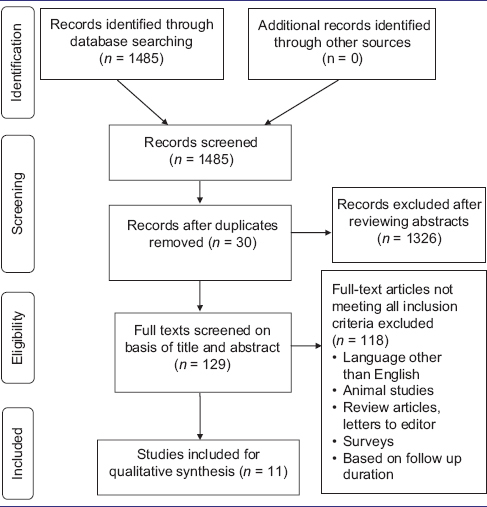 In addition, data searched for this systematic review were limited to less number of electronic databases and articles published in English language only. More number of case reports and case series on replanted avulsed permanent incisors having an extraoral dry time of <60 min and having at least 24-month follow-up period stored in a suitable, economical, and widely available storage medium and using stem cells, platelet-rich fiber, and osteogenic proteins in humans for the regeneration of PDL needs to be carried out so as to understand and improve the prognosis of the replanted tooth. This data will be helpful for the clinicians in better handling of these emergency procedures in their clinical practice. Andreasen JO, Andreasen FM, Andersson L. Textbook and Color Atlas of Traumatic Injuries to the Teeth. 4th ed. Oxford: Blackwell Munksgaard; 2007. Hamilton FA, Hill FJ, Mackie IC. Investigation of lay knowledge of the management of avulsed permanent incisors. Endod Dent Traumatol 1997;13:19-23. Trope M, Friedman S. Periodontal healing of replanted dog teeth stored in Viaspan, milk and Hank's balanced salt solution. Endod Dent Traumatol 1992;8:183-8. Trope M. Clinical management of the avulsed tooth: Present strategies and future directions. Dent Traumatol 2002;18:1-11. Andreasen JO, Borum MK, Andreasen FM. Replantation of 400 avulsed permanent incisors 3. Factors related to root growth. Endod Dent Traumatol 1995;11:69-75. Kling M, Cvek M, Mejare I. Rate and predictability of pulp revascularization in therapeutically reimplanted permanent incisors. Endod Dent Traumatol 1986;2:83-9. Andreasen JO, Hjorting-Hansen E. Replantation of teeth. I. Radiographic and clinical study of 110 human teeth replanted after accidental loss. Acta Odontol Scand 1966;24:263-86. Söder PO, Otteskog P, Andreasen JO, Modéer T. Effect of drying on viability of periodontal membrane. Scand J Dent Res 1977;85:164-8. Munavalli AN, Sachhi RJ, Kambale SS, Bandekar SD. Maintaining vitality of immediately reimplanted avulsed tooth: Two-year follow-up case report. J Indian Soc Pedod Prev Dent 2013;31:113-7. Andreasen JO. Relationship between cell damage in the periodontal ligament after replantation and subsequent development of root resorption. A time-related study in monkeys. Acta Odontol Scand 1981;39:15-25. Andersson L. Dentoalveolar ankylosis and associated root resorption in replanted teeth. Experimental and clinical studies in monkeys and man. Swed Dent J Suppl 1988;56:1-75. Andreasen JO. Interrelation between alveolar bone and periodontal ligament repair after replantation of mature permanent incisors in monkeys. J Periodontal Res 1981;16:228-35. Hiltz J, Trope M. Vitality of human lip fibroblasts in milk, Hanks balanced salt solution and Viaspan storage media. Endod Dent Traumatol 1991;7:69-72. Ashkenazi M, Sarnat H, Keila S. In vitro viability, mitogenicity and clonogenic capacity of periodontal ligament cells after storage in six different media. Endod Dent Traumatol 1999;15:149-56. Gopikrishna V, Thomas T, Kandaswamy D. A quantitative analysis of coconut water: A new storage media for avulsed teeth. Oral Surg Oral Med Oral Pathol Oral Radiol Endod 2008;105:e61-5. Gopikrishna V, Baweja PS, Venkateshbabu N, Thomas T, Kandaswamy D. Comparison of coconut water, propolis, HBSS, and milk on PDL cell survival. J Endod 2008;34:587-9. Blomlöf L, Otteskog P. Viability of human periodontal ligament cells after storage in milk or saliva. Scand J Dent Res 1980;88:436-40. Ashkenazi M, Marouni M, Sarnat H. In vitro viability, mitogenic and clonogenic capacities of periodontal ligament cells after storage in four media at room temperature. Endod Dent Traumatol 2000; 16:63-70. Blomlöf L. Storage of human periodontal ligament cells in a combination of different media. J Dent Res 1981;60:1904-6. Cvek M, Cleaton-Jones P, Austin J, Lownie J, Kling M, Fatti P, et al. Effect of topical application of doxycycline on pulp revascularization and periodontal healing in reimplanted monkey incisors. Endod Dent Traumatol 1990;6:170-6. Arrow P. An unusual healing of a replanted permanent lateral incisor. Aust Dent J 2009;54:57-60. American Association of Endodontics. Treatment of the Avulsed Permanent Tooth: Recommended Guidelines of the American Association of Endodontics 2004. Chicago: AAE Publication; 1995. American Academy of Paediatric Dentistry. Guidelines on management of acute dental trauma 2011;34:230-8. Greer JM, Moule AJ, Greer PJ. Resumed tooth development following avulsion of a permanent central incisor. Int Endod J 1996;29:266-70. Welbury R, Walton AG. Continued apexogenesis of immature permanent incisors following trauma. Br Dent J 1999;187:643-4. Kondo K, Masuda I, Fukai S, Kaneko T, Horie N, Shimoyama T, et al. Replantation of avulsed teeth using the 180-degree rotation method and a vacuum-formed splint in mixed dentition: A case report. J Oral Sci 2014;56:231-4. Tezel H, Atalayin C, Kayrak G. Replantation after traumatic avulsion. Eur J Dent 2013;7:229-32. Walter C, Krastl G, Izquierdo A, Hecker H, Weiger R. Replantation of three avulsed permanent incisors with complicated crown fractures. Int Endod J 2008;41:356-64. Otis LL, Hong JSH, Tuncay OC. Bone structure effect on root resorption. Orthodontics and Craniofacial Research 2004;7:165-77. Davidovich E, Moskovitz M, Moshonov J. Replantation of an immature permanent central incisor following pre-eruptive traumatic avulsion. Dent Traumatol 2008;24:e47-52. Ratson T, Peretz B. Bone-like material growth in a replanted immature central incisor following avulsion. Eur Arch Paediatr Dent 2013;14:271-5. Huang GT, Sonoyama W, Liu Y, Liu H, Wang S, Shi S, et al. The hidden treasure in apical papilla: The potential role in pulp/dentin regeneration and bioroot engineering. J Endod 2008;34:645-51. Wang SH, Chung MP, Su WS, Cheng JC, Shieh YS. Continued root formation after replantation and root canal treatment in an avulsed immature permanent tooth: A case report. Dent Traumatol 2010;26:182-5. Chueh LH, Ho YC, Kuo TC, Lai WH, Chen YH, Chiang CP. Regenerative endodontic treatment for necrotic immature permanent teeth. J Endod 2009;35:160-4. Ding RY, Cheung GS, Chen J, Yin XZ, Wang QQ, Zhang CF, et al. Pulp revascularization of immature teeth with apical periodontitis: A clinical study. J Endod 2009;35:745-9. Thibodeau B, Teixeira F, Yamauchi M, Caplan DJ, Trope M. Pulp revascularization of immature dog teeth with apical periodontitis. J Endod 2007;33:680-9. Biagi R, Cardarelli F, Storti E, Majorana A, Farronato G. Multiple traumatic injury to maxillary incisors in an adolescent female: Treatment outcome with two years follow-up. Ann Stomatol (Roma) 2013;4:212-7. Al-Kahtani A. Avulsed immature permanent central incisors obturated with mineral trioxide aggregate: A case report. J Int Oral Health 2013;5:88-96. Moreira-Neto JJ, Gondim JO, Raddi MS, Pansani CA. Viability of human fibroblasts in coconut water as a storage medium. Int Endod J 2009;42:827-30. Souza BD, Lückemeyer DD, Reyes-Carmona JF, Felippe WT, Simões CM, Felippe MC, et al. Viability of human periodontal ligament fibroblasts in milk, Hank's balanced salt solution and coconut water as storage media. Int Endod J 2011;44:111-5. Werder P, von Arx T, Chappuis V. Treatment outcome of 42 replanted permanent incisors with a median follow-up of 2.8 years. Schweiz Monatsschr Zahnmed 2011;121:312-20. Kinoshita S, Kojima R, Taguchi Y, Noda T. Tooth replantation after traumatic avulsion: A report of ten cases. Dent Traumatol 2002;18:153-6. Gregg TA, Boyd DH. Treatment of avulsed permanent teeth in children. UK national guidelines in paediatric dentistry. Royal College of Surgeons, Faculty of Dental Surgery. Int J Paediatr Dent 1998;8:75-81. Barrett EJ, Kenny DJ. Avulsed permanent teeth: A review of the literature and treatment guidelines. Endod Dent Traumatol 1997;13:153-63. Flores MT, Andreasen JO, Bakland LK, Feiglin B, Gutmann JL, Oikarinen K, et al. Guidelines for the evaluation and management of traumatic dental injuries. Dent Traumatol 2001;17:193-8. Andreasen JO, Borum MK, Jacobsen HL, Andreasen FM. Replantation of 400 avulsed permanent incisors 4. Factors related to periodontal ligament healing. Endod Dent Traumatol 1995;11:76-89. Andreasen JO, Borum MK, Jacobsen HL, Andreasen FM. Replantation of 400 avulsed permanent incisors 2. Factors related to pulpal healing. Endod Dent Traumatol 1995;11:59-68. Andreasen JO, Borum MK, Jacobsen HL, Andreasen FM. Replantation of 400 avulsed permanent incisors 1. Diagnosis of healing complications. Endod Dent Traumatol 1995;11:51-8. Zhao YH, Zhang M, Liu NX, Lv X, Zhang J, Chen FM, et al. The combined use of cell sheet fragments of periodontal ligament stem cells and platelet-rich fibrin granules for avulsed tooth reimplantation. Biomaterials 2013;34:5506-20.